Flow-Rite Inc., designs, supplies, and installs both new and used Push Back Pallet Racking systems. Using our extensive experience in multi-faceted warehouse racking systems, we will design a Push Back Pallet Racking system that incorporates your requirements. From an initial product and warehouse appraisal, we analyse your product types, pallet criteria, material handling equipment, available warehouse space, current pallet racking systems and warehouse shelving. This deeper understanding of your business operation forms the foundation in designing a warehouse storage solution that maximises your warehouse capacity and operational needs. The Push Back Pallet Rack system operates on the FILO (First-In, Last-Out) principle and provides highly effective use of space by combining high density storage with high speed access. The system offers safe and dense storage up to 6 pallets deep and typically up to 5 pallets high. Pallets each sit in a tray that rides along inclined rails inside the rack frame. From the front, pallets are both picked and deposited while the back of the rack remains closed. As pallets are deposited at the front of the rack, the previously placed pallet is pushed back. When a pallet is taken from the front of the rack, gravity moves the remaining pallets along the inclined rails towards the front of the rack, so the pick face remains constantly full. 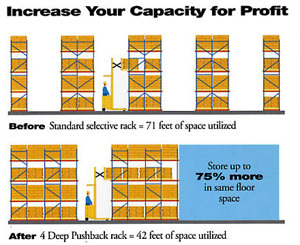 The Push Back Pallet Rack system allows you to have all the benefits of a high-density storage system without the drawbacks of a drive-in system. All lanes can be accessed from the front aisle at any time irrespective of the storage level. 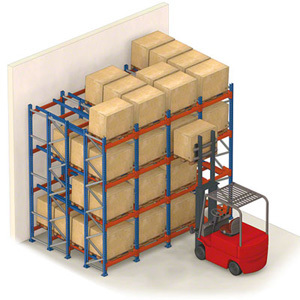 This promotes a safe and low damage environment as forklift trucks never enters the racking. When it comes to storage capacity, no system packs more pallets per square foot than our Push Back system. Cube density and selectivity are dramatically improved. Our professionals can design an new push back system to suit your specific needs, using your existing frames and beams, and there are no specialized lift trucks required. Flow-Rite Inc., will analyze your needs to determine if Push Back Pallet Racking system is the right for you. We serve Toronto, Windsor, London, Hamilton, Guelph, Waterloo, Kitchener, St. Catharines, Milton, Brampton, Fort Erie, Niagara Region, Burlington, Oakville, Mississauga, Durham Region, Oshawa, Cornwall, Belleville, Brockville, Kingston, Ottawa, Barrie and North Bay.